The Olweus Bullying Prevention Program is a school-wide, systems change program that is effective at reducing rates of bullying in a school if implemented with fidelity. Implementation should include the guidance and expertise of a Certified Olweus Trainer. Two important resources are available to prepare your school for implementation of the Olweus Bullying Prevention Program: the Readiness Assessment and the Bullying Questionnaire. The Readiness Assessment is free; the Bullying Questionnaire is a cost-effective tool available through Hazelden Publishing. The Readiness Assessment will help you gauge how prepared your school is to implement the program. The assessment consists of 16 questions. Download a copy of the Readiness Assessment (PDF). 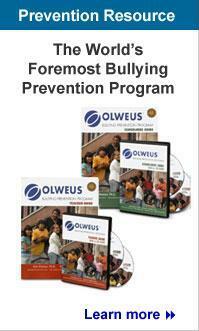 The Olweus Bullying Questionnaire is an important planning tool before and after program implementation. A District Report and Trends Report is also available. Scannable Questionnaire: Save the time and expense of manually processing questionnaire results with this scannable survey available in English and Spanish. Online Questionnaire: The Olweus Bullying Questionnaire is also available in a secure online format. This eco-friendly option saves schools the time and expense of shipping and processing printed questionnaires. All administration instructions and final reports are delivered electronically.